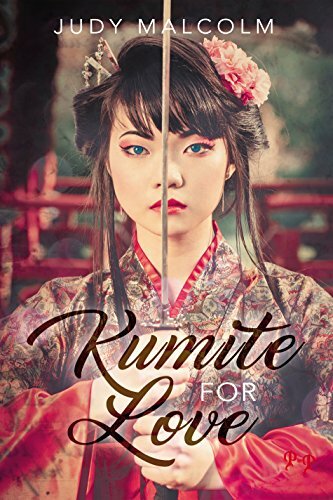 Kumite for Love is a compelling story about Aiyana Amari. A Japanese-American that learned martial arts from her father before he died in a tragic accident. Aiyana is obsessed with winning an international Kumite, a type of Japanese martial arts, tournament in Japan to save their families gym. Once she arrives in Japan, she encounters genuine artifacts in the back of a souvenir shop. She leaves the shop with a beautiful comb at the insistence of the shop owner, and after placing it in her hair, finds herself transported to 1850’s Japan. Aiyana meets an intriguing ship Captain, has a hand in a few historical events, and struggles to find her way back to the present, while wondering if she’d rather stay in the past. Kumite for Love by Judy Malcom is a very well written romance novel with a lot of depth and historical intrigue. The book had a background setting that is more interesting than you’ll find in a lot of romance novels. It was really interesting to read about Japanese culture and historical events and to journey with Aiyana as she is mistaken and subsequently becomes a geisha in the 1850’s. Captain Blackburn is an American ship captain posing under a Dutch flag in 1853 Japan where American traders are not welcome. He seeks out a geisha at a local establishment and there he finds Aiyana. The romance and building of the two main characters is done really well and I was rooting for, and very attached to, their love by the end of the book. Not to mention, the love scenes are hot. The beginning of the book starts off with Aiyana and her friend Peter at the gym practicing karate. There are only a few pages of discussion about Aiyana’s present-day life before she flies to Japan and ends up thrust back in time. I wish there had been a little more build up and description of her current life and background before she flies to Japan and jumps into the story line from the past. I think it would have helped tie the book together better and would help you become more invested in Aiyana’s struggle when she is stuck in the past with no way out. Throughout the book, Aiyana struggles with indecision as she becomes more entrenched in the world of Edo (present-day Tokyo) and Captain Blackburn. She wants to get back home, so she can compete in the Kumite tournament and win the money her family needs to save their gym. She also worries about never seeing her mother again, whom she had a fight with and left on a sour note before she flew to Japan. At the same time, she is enjoying this new life, the time she gets with Captain Blackburn, and sharing her knowledge of history as its occurring. She doesn’t know what the right answer is or what to do. Should she keep fighting to return to the present? Or embrace this new life in the past? The Moving Blade follows detective Hiroshi as he navigates street level politics to solve the murder of an American diplomat. What was the direction that you wanted to take book two in the series that was different from book one? The direction I wanted to take it is not the direction it ended up going. So, I headed more into the characters, who became more and more interesting. I focused on the roiling tumble of conflicts inside them, and what that might reflect of social, political and historical conflicts outside. I think that’s similar to book one, but because the characters are embedded into a larger framework of political pressures and international relations, their actions resonate differently. The canvas is broader in this second book, and I go deeper into Tokyo, to see the background of the characters and their choices, good and bad. I enjoyed the mix of interesting characters throughout the novel. Who was your favorite character to write for? I like all of them. Well, I don’t like the bad guys, but I like hating them. My favorites were maybe the bookstore owner twins and the radical leftist. They were fun to write and to put in scenes together, the twins steady and demure and the leftist stridently angry. Sakaguchi, the ex-sumo wrestler, is always fun to write for. He has this core set of values that is rock solid Japanese. When he explodes, he really explodes. And of course, Hiroshi developed and grew as a person and as a detective, in perhaps meandering ways, but human ways. The women characters are great to write for, too, as they pull the story in their direction. It quickly unfolds that the missing manuscript was the driving factor behind the diplomat’s death. How do you balance storytelling with mystery and action to ensure readers are engaged to the very last page? Among all the different types of mysteries, whodunnits, whydunnits, I-dunnits, I didn’t-do-its, I tend towards the why. Maybe because I was a philosophy major? Not-knowing who creates a different kind of curiosity than not-knowing why. Withholding certain pieces of information is essential. As Alfred Hitchcock pointed out, if you know there’s a bomb under the table, but the characters don’t…well, that’s suspense. And if you don’t know why the bomb is under the table in the first place, it’s really intriguing. As jazz musicians often say, and I think Mozart said it originally, the music is not in the notes, but in the silence between. I think writing should be aware of what’s not spoken, what’s not known. The unknowns make you lean in and pay attention. Where will book three in the Detective Hiroshi series take readers? Book three is called Tokyo Traffic. The story revolves around a young Thai girl who gets lost in Tokyo, after running away from some horrible people. She is rescued by a young Japanese woman who lives in an internet café and plays in a rock band. Most of the story takes place in the nighttime youth hangouts in Shibuya and Shimokitazawa, another side of Tokyo. The detectives are the same, though Hiroshi has moved in with his college girlfriend and Takamatsu is off suspension. It goes deeper into the characters and deeper into Tokyo. When the top American diplomat in Tokyo, Bernard Mattson, is killed, he leaves more than a lifetime of successful Japan-American negotiations. He leaves a missing manuscript, boxes of research, a lost keynote speech and a tangled web of relations. When his alluring daughter, Jamie, returns from America wanting answers, finding only threats, Detective Hiroshi Shimizu is dragged from the safe confines of his office into the street-level realities of Pacific Rim politics. With help from ex-sumo wrestler Sakaguchi, Hiroshi searches for the killer from back alley bars to government offices, through anti-nuke protests to military conspiracies. When two more bodies turn up, Hiroshi must choose between desire and duty, violence or procedure, before the killer silences his next victim. 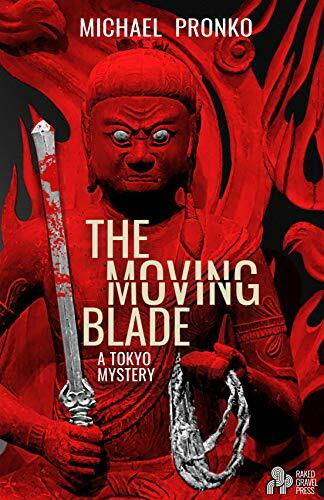 THE MOVING BLADE is the second in the Tokyo-based Detective Hiroshi series by award-winning author Michael Pronko. Thrust back to feudal Japan, martial arts expert Aiyana Amari’s most challenging battle is the choice to either return home or leave the love of her life behind. To save her family’s dojo and keep her father’s legacy alive, Aiyana Amari travels to Japan to compete in the Meiji martial arts tournament. But on the eve of the competition, Aiyana is thrust back to 1853 into the life of a geisha. Captain Derek Blackburn, a sailor for the Dutch, returns to Japan to avenge his brother’s murder and secretly plans to assassinate the one ultimately responsible–Shogun Ieyoshi. Like the two stars celebrated in the Tanabata Festival, Aiyana and Derek meet on the seventh day of the seventh month. Their wills clash. Aiyana is desperate to get home, but Derek needs her for his scheme of revenge. After falling in love a decision tougher than a sparring match must be made. Will Aiyana return home or stay with her one true love in the past? Forgotten Letters follows Robert and Makiko as they overcome many obstacles for family, love, and faith, during a tumultuous time in history. What was the inspiration for this heartfelt novel? The inspiration for my story was a dream that I had 15 years ago. The entire story was in my dream. I did not have a recurrent dream ever again but the story was always on my mind. I would think about the story frequently but told no one about the dream for years. I then told my wife and several good friends my dream. They were spellbound and when I finished they said I should write a book. I put the project on hold for over 10 years and started to put the story on paper 4 years ago. Robert and Makiko deep and well developed relationship. Was there relationship planned or did it develop organically while writing? Robert and Makiko’s relationship was always part of my dream. As the book developed so did their relationship change. I had several beta readers help make very good suggestions during to project. In fact we added a few sentences to the book just before printing that solidified their relationship. You wrote this book with Mario Acevedo. What was the writing collaboration like? Mario Acevedo is a very talented and professional author who has produced a number of very good books. To name a few “Werewolf Smackdown, Blood Business, Rescue From Planet Pleasure” and many more. Mario was very easy to work with and has a wonderful imagination. Mario and I worked very well together and I thank him so much for all his input. This book was able to get many historical and biblical details correct. What kind of research did you undertake for this book? The research we did was a great deal of fun and good learning experience. For a majority of the facts we used Google but we each relied on our military backgrounds to help with those facts. In the beginning of my dream there was a big earthquake in Japan early 1900’s. I thought Japan always has earthquakes so I did research for that time period . I found that in 1923 the “Great Kanto“ earthquake destroyed both Tokyo and Yokohama with shaking and fires. The fires were started by the open hibachi stoves in most houses at that time. Remember three things when reading Forgotten Letters a spider, baseball and birthmark. These three items will be introduced at the beginning of the story and again introduced later on. I think the reader will smile at reading each of the words again. A trove of forgotten letters reveals a love that defied a world war. In 1924, eight-year old Robert Campbell accompanies his missionary parents to Japan where he befriends a young Makiko Asakawa. Robert enjoys his life there, but the dark tides of war are rising, and it won’t be long before foreigners are forced to leave Japan. The outbreak of total war sweeps all before it, and when correspondence ends with no explanation, Robert fears the worst. He will do anything to find Makiko, even launch himself headfirst into a conflict that is consuming the world. Turmoil and tragedy threaten his every step, but no risk is too great to prove that love conquers all. 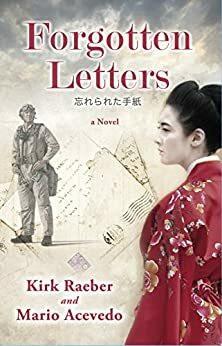 Forgotten Letters is a beautifully told story of family, love, faith, and war that focuses on Robert Campbell, an American and his love interest, Makiko Asakawa, who is of Japanese descent. The two meet as children when Robert’s family stay with Makiko’s family in Yokohama during the 1920s to 1930s. It’s during this time that a relationship is formed between the two. Robert’s family eventually moves back to the United States while he is still in school, but Robert and Makiko vow to see each other again and maintain their bond by writing letters to each other. It is not until the 1940s, with the attack on Pearl Harbor and the outbreak of World War II that the two are reunited. The novel delicately pieces together the story of these two individuals living through death and devastation as they fight to get back to each other. 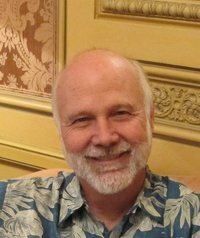 Kirk Raeber does an excellent job of handling the intricate details of the novel. There are a lot of historical components to this piece, and the author weaves his fictional story into American and Japanese history among other components of the novel flawlessly. Firstly, Robert’s father is a preacher; therefore, a lot of his lessons for a young Robert are based on scripture and particular Bible verses. Robert often returns to these Bible verses during trying moments in his life. It’s clear that the author had some knowledge of the Bible and took great care in picking out the right verse during difficult moments in Robert’s life. Secondly, the author seems to be aware of American and Japanese culture during the time period that the novel spans. Also, even though this is a fictional story, there are historical elements weaved into it, such as the attack on Pearl Harbor and the bombing of Hiroshima and Nagasaki. Raeber does not skip over these aspects of history, but rather he weaves them into Robert and Makiko’s story, illustrating not only how these unfortunate events impacted these two fictional characters, but it can also be reasoned that his telling of their story resonates the mood and despair of those that actually lived through the experience. It’s clear that Raeber took care while writing these events to make sure that he handled them with accuracy. A small note of criticism lies within the secondary characters of the novel, Robert and Makiko’s son and daughter. The whole story begins when the adult children are going through their deceased parents’ belongings and stumble upon the letters that the two lovers exchanged long ago. This then leads into Robert and Makiko’s storyline, and the reader isn’t returned to the characters of the adult children until the end of the novel. While Robert and Makiko’s story is obviously the focus of the novel, it would have been nice to be returned to the adult children periodically throughout the novel. The placing of these two characters at the very beginning and very end of the novel creates a disconnect with them, and it leaves one questioning their purpose overall. It’s very possible that Robert and Makiko’s story can be told without the mention and inclusion of their children as characters. Overall, Raeber’s Forgotten Letters is a beautifully told story of love’s triumph over distance, death, and war. This novel is highly recommended to those that might have an interest in World War II, 1940s Japanese culture, or anyone who just enjoys a good love story. The Last Train revolves around Michiko Suzuki and the team of detectives that are investigating the train murders. What was the inspiration to the setup to this thrilling novel? For quite a few years I was writing about jazz every week, so I was always going to Roppongi and Shinjuku and Shibuya, nightlife parts of the city. I’d see the hostesses who work in all the clubs there, and they would often be in the jazz clubs. They were almost always strikingly attractive, but underneath that seemed some sadness. Whatever one thinks of their work, the women seemed smart. What impressed me most, though, was the great personal dignity with which they carried themselves. So, I started wondering what kind of life those women lived, and what if they turned the tables. What if one of those people-savvy women took things into her own hands to do things men usually do? And what was this odd dynamic between men and women that seemed so unfair to women, but then again, was something else, too. Many Japanese women might not even say Japanese society is unfair exactly, perhaps because Tokyo is home to a vibrant urban culture where women are incredibly free to do what they want and live how they like. But, what would that freedom turn into if taken to an extreme? Michiko is that extreme. The men struggle to catch up. Michiko is the daughter of a factory owner whose mother died when she was young. Her character continues to get deeper as the story progresses. What did you use as a starting point for the character and what was your guidance as you built the character? I think the way Michiko grew as a character was based on my observation of women, and men, in Tokyo, but all kinds of women, not just hostesses. There’s a lot of people TO observe in Tokyo, for one thing, but I like to talk and interact with people as much as I can. Michiko is a “typical” character in that her experience parallels the shift in Japan from a manufacturing society, which is where Michiko grew up, to an information and service society, which is how she makes money. I wondered how that shift affected women? Is it easier for women to adapt to economic changes than men, or harder? Michiko is working class in origin, growing up above a factory, but she turns herself into something else altogether through her own efforts. She’s tough and resilient, which is how I see most Japanese women, and yet still very feminine in traditional ways. She has no hesitation to compete in a man’s world, and to do it on her own terms. Like many characters, once she was created, everything followed from that. The novel takes place in Tokyo. Why did you choose a train station in Japan as the setting to your novel? Trains are one of the things I love most about Tokyo, but they are also these huge masses of steel shooting through a very densely populated city. Just as America is built around the car, Tokyo is built around trains. Suicides on the train lines, sadly, happen all too often. I came upon the clean-up after a suicide one time years ago, and the image stayed with me. Like every other commuter, I have been stuck waiting on a train or a platform when a suicide shuts down the entire train system. It’s so shocking because usually everything runs on time. So, I guess, if you transplant the American car chase to Tokyo, it becomes a train chase, or a chase on a train. I also like that as a setting because trains and train stations are great levelers. Everyone takes the train, together, equally. I also love trains and train stations because I can completely indulge in people-watching. It’s startling how many people you see in a day. Still, it’s never so lonely as in a crowd, and there’s always a crowd in Tokyo. The next novel is called Japan Hand and Detective Hiroshi is again in the lead, together with Sakaguchi. They investigate the death of a long-time Japan specialist who helped negotiate the complicated relations between Japan and America, including the US military bases in Japan. That novel should be out by December of this year or early 2018. The next one after that is called Thai Girl in Tokyo and will be out in spring of 2018. I’ve finished writing those both, so they’re now being edited and polished.